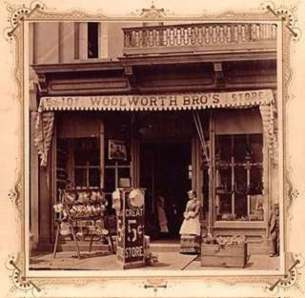 The first Woolworth store was opened by Frank Winfield Woolworth on February 22, 1878, as "Woolworth's Great Five Cent Store" in Utica, New York. Though it initially appeared to be successful, the store soon failed. When Woolworth searched for a new location, a friend suggested Lancaster, Pennsylvania. Using the sign from the Utica store, Woolworth opened his first successful "Woolworth's Great Five Cent Store" on July 18, 1879, in Lancaster. He brought his brother, Charles Sumner Woolworth, into the business. Frank Winfield Woolworth was an American entrepreneur and the founder of F. W. Woolworth Company and the operator of variety stores known as "Five-and-Dimes" or dimestores, which featured a low-priced selection of merchandise. He pioneered the now-common practices of buying merchandise directly from manufacturers and fixing the selling prices on items, rather than haggling. 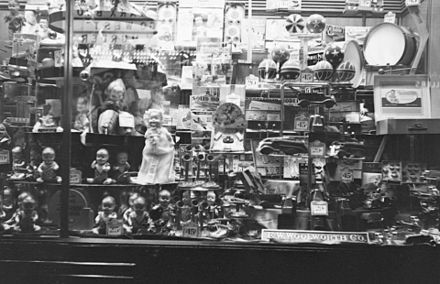 He was also the first to use self-service display cases, so customers could examine what they wanted to buy without the help of a sales clerk. Utica is a city in the Mohawk Valley and the county seat of Oneida County, New York, United States. The tenth-most-populous city in New York, its population was 62,235 in the 2010 U.S. census. Located on the Mohawk River at the foot of the Adirondack Mountains, Utica is approximately 95 miles northwest of Albany, 55 mi (89 km) east of Syracuse and 240 miles northwest of New York City. Utica and the nearby city of Rome anchor the Utica–Rome Metropolitan Statistical Area, which comprises all of Oneida and Herkimer counties. The two Woolworth brothers pioneered and developed merchandising, direct purchasing, sales, and customer service practices commonly used today. Despite its growing to be one of the largest retail chains in the world through most of the 20th century, increased competition led to its decline beginning in the 1980s, while its sporting goods division grew. The chain went out of business in July 1997, when the company decided to focus primarily on sporting goods and renamed itself Venator Group. By 2001, the company focused exclusively on the sporting goods market, changing its name to the present Foot Locker, Inc., changing its ticker symbol from its familiar Z in 2003 to its present ticker (NYSE : FL). Retail chains using the Woolworth name survive in Austria, Germany, Mexico and, until early 2009, the United Kingdom. The similarly named Woolworths supermarkets in Australia and New Zealand are operated by Australia's largest retail company, Woolworths Limited, a separate company with no historical links to the F. W. Woolworth Company or Foot Locker, Inc. However, Woolworths Limited did take their name from the original company, as it had not been registered or trademarked in Australia at the time. Similarly, in South Africa, Woolworths Holdings Limited operates a Marks & Spencer-like store and uses the Woolworth name, but has never had any connection with the American company. The property development company Woolworth Group in Cyprus began life as an offshoot of the British Woolworth's company, originally operating Woolworth's department stores in Cyprus. In 2003, these stores were rebranded Debenhams, but the commercial property arm of the business retained the Woolworth's name. Discounts and allowances are reductions to a basic price of goods or services. The term fixed price is a phrase used to mean the price of a good or a service is not subject to bargaining. The term commonly indicates that an external agent, such as a merchant or the government, has set a price level, which may not be changed for individual sales. In the case of governments, this may be due to price controls. An Edgeworth price cycle is cyclical pattern in prices characterized by an initial jump, which is then followed by a slower decline back towards the initial level. The term was introduced by Maskin and Tirole (1988) in a theoretical setting featuring two firms bidding sequentially and where the winner captures the full market. Dry goods is a historic term describing the type of product line a store carries, which differs by region. The term comes from the textile trade, and the shops appear to have spread with the mercantile trade across the British colonial territories as a means of bringing supplies and manufactured goods out to the far-flung settlements and homesteads that were spreading around the globe. Starting in the mid-1700s, these stores began by selling supplies and textiles goods to remote communities, and many customized the products they carried to the area's needs. This continued to be the trend well into the early 1900s; but with the rise of the department stores and catalog sales, the decline of the dry goods stores began. Harrisburg is the capital city of the Commonwealth of Pennsylvania in the United States, and the county seat of Dauphin County. With a population of 49,192, it is the 15th largest city in the Commonwealth. It lies on the east bank of the Susquehanna River, 107 miles (172 km) west of Philadelphia. Harrisburg is the anchor of the Susquehanna Valley metropolitan area, which had a 2017 estimated population of 571,903, making it the fourth most populous in Pennsylvania and 96th most populous in the United States. In 1910, Frank Woolworth commissioned the design and construction of the Woolworth Building in New York City. 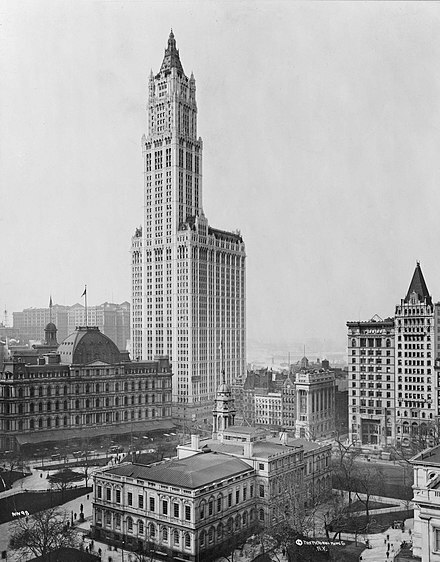 A pioneering early skyscraper, it was designed by American architect Cass Gilbert, a graduate of the MIT architecture school. The building was paid for entirely in cash. It was completed in 1913 and was the tallest building in the world until 1930. It also served as the company’s headquarters until it was sold by the F.W. Woolworth Company’s successor, the Venator Group (now Foot Locker), in 1998. On March 17, 1997, Wal-Mart replaced Woolworth's as a component of the Dow Jones Industrial Average. 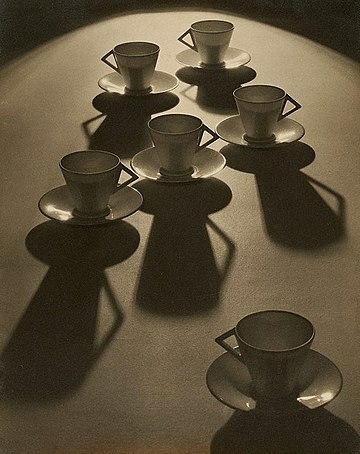 Analysts at the time cited the lower prices of the large discount stores and the expansion of supermarket grocery stores – which had begun to stock merchandise also sold by five-and-dime stores – as contributors to Woolworth's decline in the late 20th century. On July 17, 1997, Woolworth's closed its remaining department stores in the U.S. and changed its corporate name to Venator. In 2015, a group of retro activists, including Victor Corporation of America, launched an online retailer using the F.W. Woolworth name in an effort of making a retail comeback. The online retailer features brands including Victor Talking Machine Co., Parisi Studios, Bite Size, Author Court, and Case Escape. It carries products including clothing, electronics, gifts, vegan products, lifestyle, home, and furniture. According to Victor Corporation of America's LinkedIn page, they are currently the parent company of F. W. Woolworth Co. It now has its U.S. online site at www.woolworthsusa.com. In 1978, X-Ray Spex released the song, "Warrior in Woolworths", on their album, Germfree Adolescents . In 1986 Kathy Mattea released the Nanci Griffith penned song Love at the Five and Dime , in which the two subjects meet at a Woolworth. In 2012, British electro-pop duo Blancmange released the song, "By the Bus Stop @ Woolies", on their album Blanc Burn . 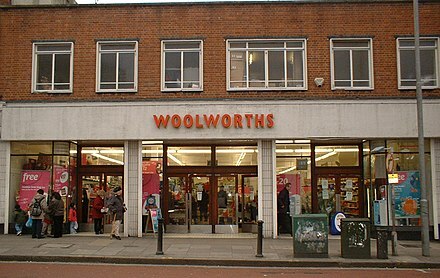 Woolworth's in Bridgetown, Barbados operates independently, having split from the British branch in 1982. It was established in the 1950s, stocking goods shipped from Britain. A variety store is a retail store that sells a wide range of inexpensive household goods. Woolco was an American-based discount retail chain. It was founded in 1962 in the city of Columbus, Ohio, by the F. W. Woolworth Company. It was a full-line discount department store unlike the five-and-dime Woolworth stores which operated at the time. At its peak, Woolco had hundreds of stores in the US, as well as in Canada and the United Kingdom. While the American stores were closed in 1983, the chain remained active in Canada until it was sold in 1994 to rival Walmart, which was looking to enter the Canadian market. All of the former UK Woolco stores were sold by Kingfisher, who had bought the UK Woolworth business, to Gateway who subsequently sold them to Asda. A discount store or discount shop is a retail shop which sells products at prices that are lower than the typical market price. S. H. Kress & Co. was the trading name of a chain of "five and dime" retail department stores in the United States of America, established by Samuel Henry Kress, which operated from 1896 to 1981. In the first half of the 20th century, there were Kress stores with ornamented architecture on "Main Street" in hundreds of cities and towns. Giant Tiger Stores Ltd. is a Canadian discount store chain which operates over 250 stores across Canada. The company's stores operate under the Giant Tiger banner in Alberta, Manitoba, New Brunswick, Nova Scotia, Prince Edward Island and Saskatchewan; under the GTExpress and Scott's Discount banners in Ontario only, and under the Tigre Géant banner in Quebec. Sayvette was a discount department store in Canada from 1961 to 1977. The chain was announced in February 1961, and launched its first store at Thorncliffe Market Place in a Toronto suburb that September. Over 70,000 customers passed through the first Sayvette on September 7, 1961. Sayvette City, at the southwest corner of Yonge Street and Steeles Avenue, opened in November, claiming to have the largest retail space in Metropolitan Toronto. Sayvette carried St. Michael-branded goods from British department store Marks and Spencer. A lunch counter is a small restaurant, similar to a diner, where the patron sits on a stool on one side of the counter and the server or person preparing the food serves from the opposite side of the counter, where the kitchen or limited food preparation area is located. As the name suggests, they were primarily used for the lunch meal. Lunch counters were once commonly located inside retail variety stores and smaller department stores. 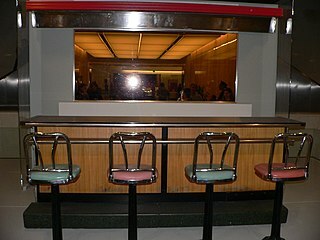 The intent of the lunch counter in a store was to profit from serving hungry shoppers, and to attract people to the store so that they might buy merchandise. Eastbay is an American supplier of athletic footwear, apparel and sports equipment, which sells by direct mail. Since 1997, it has been the direct-to-mail division of the F. W. Woolworth Company, now known as Foot Locker, Inc.. Champs Sports is an American sports retail store, it operates as a subsidiary of Foot Locker. Products sold at Champs Sports include apparel, equipment, footwear, and accessories. As of January 2015, there were 547 store locations found throughout the United States, Canada, Puerto Rico, and the U.S. Virgin Islands. The stores are mainly located in shopping malls, and are 3,500 square feet (330 m2) on average. The G.R. Kinney Company was an American manufacturer and retailer of shoes from 1894 until September 16, 1998. 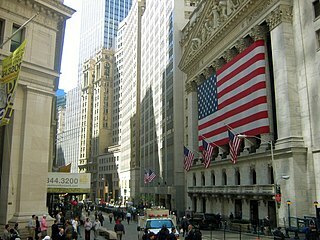 Its listing on the New York Stock Exchange, symbol KNN, began in March 1923. The shoe concern was started by George Romanta Kinney whose father ran a general store in rural Candor, New York. The father became indebted and George vowed to repay his indebtedness. In 1894, at the age of 28, he had saved enough to purchase a Lester retail outlet in Waverly, New York. Kinney succeeded by selling affordably priced shoes to working Americans. The Woolworth Building is an historic building in Watertown, New York. It is a contributing building in the Public Square Historic District. Plans for the Woolworth Building were begun in 1916 by Frank W. Woolworth, the founder of the Woolworth's chain of department stores. Charles Sumner Woolworth, was an American entrepreneur who went by the nickname of "Sum", opened and managed the world's first five-and-dime store in Scranton, Pennsylvania, and was founder of the "C. S. Woolworth & Co" chain of 5¢ & 10¢ stores. Sum's brother, Frank Winfield Woolworth was first to venture into the retail business with his own store, and soon after, he asked Sum to join him. 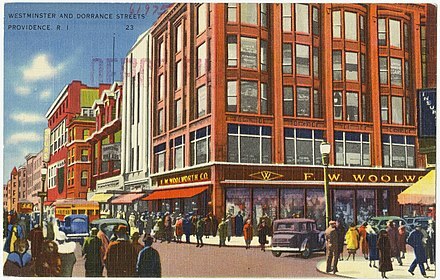 Frank founded "F. W. Woolworth & Co", which later merged with other Woolworth affiliate stores to be the F. W. Woolworth Company. After the death of his brother, Sum became the longest serving Chairman of the F. W. Woolworth Company. During the early years, Sum also partnered with a long-time friend, Fred Kirby, to open a "Woolworth and Kirby" store in Wilkes Barre, Pennsylvania. When Fred bought out Sum's share, that store grew to become a "friendly rival" affiliate store, in close alliance with the two Woolworth brothers. Big W was a large format chain of megastores owned by the Kingfisher Group. This chain consisting of Kingfisher's British retail chains, which were Comet, B&Q, Superdrug and Woolworths in one large megastore. Even though Woolworths scrapped the brand name in 2004, they continued to operate 14 of the stores and all of them but one remained until the administration in 2008. Despite sharing the name with the Australian chain Big W, they are not related, being owned by two different companies. Big W's tagline was A lot for not a lot. E. P. Charlton & Company, also known as E. P. Charlton Company, E. P. Charlton, or simply Charlton's was an American chain of five and ten cent stores owned by Earle Perry Charlton, which merged with several associated brands to create the F. W. Woolworth Company in 1912. Metropolitan Stores of Canada Ltd. was a former Canadian chain of variety stores based in Winnipeg, Manitoba. The Metropolitan Stores chain was founded in 1920 and also operated junior department and clothing stores under the SAAN, Greenberg and Red Apple banners. At its peak, Metropolitan was one of the four largest variety chain store organizations in Canada with 180 stores in all the provinces and territories. In French, the chain was known as le Met and Métropolitain. Fred Morgan Kirby (1861-1940) from Wilkes-Barre, Pennsylvania was the co-founder and vice president of the F. W. Woolworth Company, creator of the concept of 5 and 10-cent stores, and a philanthropist. Kirby’s creation of 5 and 10-cent stores revolutionized consumer culture in Pennsylvania and across the United States. ↑ "Foot Locker, Inc". Foot Locker, Inc. Retrieved July 11, 2010. ↑ "Our Story – 1924 September". Woolworths Limited. Retrieved June 10, 2013. ↑ James Robinson (November 19, 2008). "Woolworths: the rise and fall of the department store empire". The Guardian. ↑ "Welcome to the Woolworths Museum". ↑ Helen Pike (December 5, 1999). "Woolworth in New Jersey: A Love-Hate Relationship". The New York Times . Retrieved June 27, 2008. ↑ Plunkett-Powell, Karen (1999). "Remembering Woolworth's: A Nostalgic History of the World's Most Famous Five-and-Dime". New York: St. Martin's Press. Retrieved October 23, 2011. ↑ "Study for Woolworth Building, New York". World Digital Library . December 10, 1910. Retrieved July 25, 2013. 1 2 Barmash, Isadore (December 13, 1992). "Chain by Chain, Woolworth Reinvents Itself". The New York Times . p. 5, Sec. 3. Retrieved December 15, 2018. ↑ Key, Janet. "WOOLWORTH WILL ADD 800 STORES". chicagotribune.com. Retrieved September 30, 2018. ↑ "Dow Jones Industrial Average Historical Components" (PDF). S&P Dow Jones Indices LLC. September 23, 2013. Retrieved October 24, 2015. ↑ "History". F. W. Woolworth Co. Retrieved April 17, 2018. ↑ "F. W. Woolworth Co. Online Store | Handmade gifts, essentials & more". F. W. Woolworth Co. Retrieved April 17, 2018. ↑ "Victor Corporation of America". LinkedIn. Retrieved April 16, 2018. ↑ Block, Justin (July 9, 2013). "Old School Mall Stores That Need to Make a Comeback". Complex. Retrieved October 24, 2015. ↑ Barrow, Mandy. "British Christmas Traditions — Christmas Trees". Project Britain. Retrieved October 24, 2015. ↑ "Foster Grant Collection". Syracuse University Library. 2006. Retrieved October 24, 2015. ↑ "60s Mods". retrowow.co.uk. Retrieved October 24, 2015. ↑ Moody, Anne (1968). Coming of Age in Mississippi. New York: Bantam Dell. ↑ Abel, Elizabeth (May 14, 2015). Signs of the Times: The Visual Politics of Jim Crow (eBook Collection (EBSCOhost). Web. ed.). Berkeley, California: University of California Press. ↑ Burns, Trip (May 23, 2013). "Real Violence: 50 Years Ago at Woolworth". Jackson Free Press. Jackson, Mississippi. ↑ "When Nijinsky met Woolworths". Leither Magazine. March 30, 2013. Retrieved October 24, 2015. ↑ Ryan Firekeeper (September 24, 2011). "O Brother Where Art Thou - Woolsworth". YouTube . Retrieved June 25, 2017. ↑ "O Brother, Where Art Thou? (2000) - Quotes". IMDb . June 25, 2017. Retrieved June 25, 2017. ↑ "Civil Rights Greensboro". Library.uncg.edu. Retrieved November 17, 2011. ↑ "The Former Woolworth's store on Campbell Avenue." Roanoke Times. February 17, 2017. Page 8. ↑ "H.T. Parson to Head Woolworth Stores. Acting President Since Death of Founder of System Named as Successor. C.S. Woolworth Elected to Newly Created Position as Chairman of the Board". The New York Times . June 12, 1919. Retrieved December 4, 2011. H.T. Parson was elected President of F.W. Woolworth Co. yesterday at the organization meeting of the Directors, to succeed the late Frank W. Woolworth, founder of the system of 5 and 10 cent stores. ↑ "Frederick E. Hennig Retires From Woolworth Corporation". Thefreelibrary.com. March 13, 1995. Retrieved November 17, 2011. 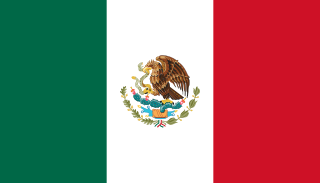 ↑ "Control Dinamico SA acquires Woolworth Mexicana SA de CV from Foot Locker Inc (1997/12/08) – Thomson Financial Mergers & Acquisitions". AlacraStore.com. December 8, 1997. Retrieved July 11, 2010. ↑ "Localización/Woolworth". Woolworth.com.mx. Archived from the original on March 2, 2008. Retrieved July 11, 2010. ↑ "The Bargain! Shop:About us" . Retrieved October 18, 2012. ↑ "Woolworth Corporation completes Disposition of Canadian Woolco Stores to Wal-Mart". PRNewswire. March 17, 1994. Retrieved October 18, 2012. ↑ "Foot Locker Canada Inc". ↑ "Woolworths the fresh food people". Woolworths.com.au. September 22, 1924. Retrieved July 11, 2010. ↑ "Woolworths". Woolworths. March 20, 2007. Archived from the original on July 22, 2011. Retrieved July 11, 2010. Wikimedia Commons has media related to F. W. Woolworth Company .